So a person who begins to follow this path and who wants his actions to be for the sake of Heaven, discovers the truth that the more he performs actions with the intention of in order to bestow, and also that he is distant from it, which means that there is a special merit in this work, that the truth is being revealed to him from Above, and that a person is far from any actions of bestowal. Our advancement is based only on the different revelations that are unpleasant for our ego, for our desire to receive. Every time it turns out that if we are immersed in our ego, we cannot advance spiritually. I am immersed in my ego, and the Light comes from Above and emphasizes the level of ego I am on. As a result I feel a big minus (-) that reflects the depth (H) of my desire. To the extent that I feel bad, I have to discern what I have to do in that very bad feeling. 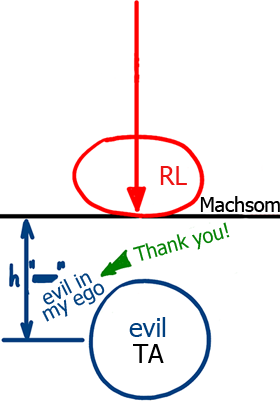 I can be grateful for the evil since by that I discover to what extent I am opposite from spirituality and bestowal. The evil is revealed in my ego, in my desire to receive in order to receive, and if this desire disappears, I will not even know that I am immersed in evil. The depth of the bad feeling is the index of truth for me; it is the right sign. So from this state I ask for adhesion; I want to be above this, above the border of Egypt, above my ego, above the Machsom (barrier). Here I begin to build the Returning Light (RL) and implement the first restriction on the whole lower part (Tzimtzum Aleph – TA). 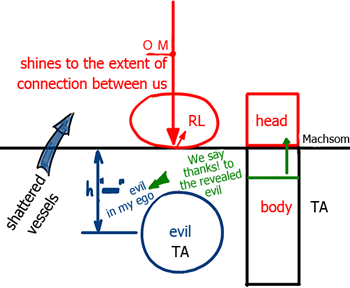 This is how the spiritual Partzuf is built of two parts; “a head’ and “a body.” Because I have implemented the first restriction, I already have a “body.” Later I may be able to raise part of it and to connect it to the “head” and this will already be a real Partzuf above the Machsom. Thus, through the stages of Ibur (gestation), Yenika (suckling), and Mochin (mind), I transfer all the “shattered vessels” from the bottom upward. We already begin to feel that this is practical work that can be performed. But we shouldn’t forget that it is done by the Light that Reforms (the Surrounding Light – Ohr Makif – OM), and that we can summon it only by the connection between us. Actually, everything that we have learned and read about can be put together into one simple feasible picture of Ten Sefirot, and we can see that the whole world, all our states, are only meant to provide the right spiritual pattern for that at any given moment. Let’s hope that the state we are creating will remain in each one as a clear pattern. The perception of the world, my attitude to everyone, my feelings, everything that I want to understand and to feel has to go through this pattern. Then we will be able to solve all the problems that come from the Creator, from the Light, correctly by responding correctly and supporting Him, and allowing Him to reveal the right actions. Question: How can we actually thank the Creator for all the bad states? Answer: It is true that lying won’t help us here; you cannot cry and honestly kiss the stick that beats you. But if you feel that the stick is beating your evil inclination, if you don’t want to identify with it but with the good inclination, then you already see the differences in a certain inclination to the Creator. It is only thanks to the Surrounding Light that we feel that we are bad. Fifty years ago everyone still thought that a bright future and prosperity lie ahead. Then the global trend of decline became apparent and we began to sink into the dark. A person with a point in the heart (•) also begins to enter evil, the darkness that comes to him by the Light that Reforms. 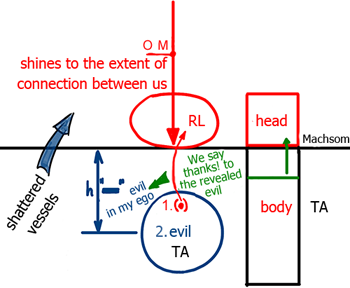 But at the same time the Light illuminates the point in the heart so that the evil pulls a person downward while the point rises higher and higher upward. 2. The evil in us. Only then will I discover whom I identify with. Question: How do you get rid of disturbing thoughts about a reward, about a gift that the Creator will give me for my work? Answer: You will have to constantly cope with these thoughts in order to ascend without asking for anything and only identifying with the point in the heart time and time again. This “ping pong” game continues until the Light that Reforms comes through the connection in the group and takes you to the next level. There, a stronger Light will come and will again reveal the outcomes of the shattering in you. It is because we used to be connected once and then the Creator who created the connection between us shattered it. Now we have to participate in the correction, to wake up and to summon Him. Then the Light comes and does all the work.